Well, the results are in, and after polling a large group of no less than 7 people (with myself being the 7th) ages 5-35, I have the official results of the Vanilla Creme Cookie Challenge. Pictured to the left are the contestants in the VCCC. 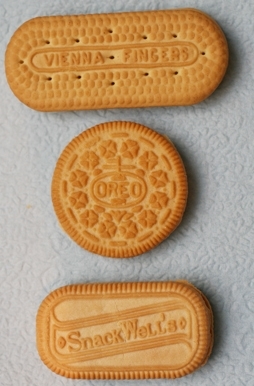 From top to bottom they are: Vienna Fingers, Golden Oreos, and SnackWell’s Vanilla Creme. Testers were instructed to taste a bit of each cookie and select their favorite. I prefer my Vanilla Creme cookies served cold. Both the Vienna Fingers and the Golden Oreos were chilled, but the SnackWell’s never made it into the fridge. This difference in temperature may have affected results, but I don’t really know for certain if it did. I expected to walk away from this test with a clear winner – which in one way I did, but in another, it was a split decision. Namely, because the testers decided that there were two factors when it comes to selecting their favorites. So I’m breaking out the results into Favorite Vanilla Cookie Flavor and Favorite Vanilla Cookie for Snacking – the idea being that certain cookies could not be eaten in mass quantities. This was a clear winner, with 6/7 tasters saying in terms of a good tasting cookie, the Golden Oreo was the best by far. These results weren’t as clear-cut but SnackWell’s came out as the winner. First, two of the subjects didn’t let me know which was their favorite cookie for snacking (they were 4-6 yrs old…so I’m not sure they’d really know what I meant.) The final breakdown was 3 for SnackWell’s, 1 for Golden Oreos, and 1 for Vienna Fingers.